Wind-row composting consists of placing the mixture of raw materials in long narrow piles called wind-rows (Plate 7) that are agitated or turned on a regular basis (NRAES, 1992). The turning operation mixes the composting materials and enhances passive aeration. Typically, the wind-rows are from 90 cm high for dense materials such as manures to 360 cm high for light, voluminous materials such as leaves. They vary in width from 300 to 600 cm. The equipment used for turning determines the size, shape and spacing of the wind-rows. Bucket loaders with a long reach can build high wind-rows. Turning machines produce low, wide wind-rows. Wind-rows aerate primarily by natural or passive air movement (convection and gaseous diffusion). The rate of air exchange depends on the porosity of the wind-row. Therefore, the size of a wind-row that can be aerated effectively is determined by its porosity. A wind-row of leaves can be much larger than a wet wind-row containing manure. Where the wind-row is too large, anaerobic zones occur near its centre. These release odours when the wind-row is turned. On the other hand, small wind-rows lose heat quickly and may not achieve temperatures high enough to evaporate moisture and kill pathogens and weed seeds. For small- to moderate-scale operations, turning can be accomplished with a front-end loader or a bucket loader on a tractor. The loader lifts the materials from the wind-row and spills them down again, mixing the materials and reforming the mixture into a loose windrow. The loader can exchange material from the bottom of the wind-row with material on the top by forming a new wind-row next to the old one. In order to minimize compaction, this needs to be done without driving onto the wind-row. Wind-rows turned with a bucket loader are often constructed in closely spaced pairs and then combined after the wind-rows shrink in size. Where additional mixing of the materials is desired, a loader can be used in combination with a manure spreader. There are a number of specialized machines for turning wind-rows that reduce the time and labour involved considerably, mix the materials thoroughly, and produce a more uniform compost. Some of these machines attach to farm tractors or front-end loaders, others are self-propelled. A few machines can also load trucks and wagons from the wind-row. It is very important to maintain a schedule of turning. The frequency of turning depends on the rate of decomposition, the moisture content and porosity of the materials, and the desired composting time. Because the decomposition rate is greatest at the start of the process, the frequency of turning decreases as the wind-row ages. Easily degradable or high N mixes may require daily turnings at the start of the process. As the process continues, the turning frequency can be reduced to a single turning per week. In the first week of composting, the height of the wind-row diminishes appreciably and by the end of the second week it may be as low as 60 cm. It may be prudent to combine two windrows at this stage and continue the turning schedule as before. Consolidation of wind-rows is a good wintertime practice for retaining the heat generated during composting. This is one of the advantages of wind-row composting. It is a versatile system that can be adjusted to different conditions caused by seasonal changes. With the wind-row method, the active composting stage generally lasts three to nine weeks depending upon the nature of the materials and the frequency of turning. Eight weeks is usual for manure composting operations. Where three weeks is the goal, the wind-row requires turning once or twice per day during the first week and every three to five days thereafter. Under the passively aerated wind-row method, air is supplied to the composting materials through perforated pipes embedded in each wind-row, thereby eliminating the need for turning. The pipe ends are open. Air flows into the pipes and through the wind-row because of the chimney effect created as the hot gases rise upward out of the wind-row. The wind-rows should be 90-120 cm high, built on top of a base of straw, peat moss or finished compost to absorb moisture and insulate the wind-row. The covering layer of peat or compost also insulates the wind-row, discourages flies, and helps to retain moisture, odour and ammonia. The plastic pipe is similar to that used for septic-system leach fields with two rows of 1.27-cm diameter holes drilled in the pipe. In many aerated pile applications, the pipe holes are oriented downward to minimize plugging and allow condensate to drain. However, some researchers recommend that the holes face upwards. The wind-rows are generally formed by the procedures described for the aerated static pile method. Because the raw materials are not turned after the wind-rows are formed, they must be mixed thoroughly before they are placed in the wind-row. It is important to avoid compaction of materials while constructing the wind-row. Aeration pipes are placed on top of the peat/compost base. When the composting period is completed, the pipes are removed, and the base material is mixed with the compost. This method has been studied and used in Canada for composting seafood wastes with peat moss, manure slurries with peat moss, and solid manure with straw or wood shavings. Manure from dairy, beef, swine and sheep operations has been used. The aerated static pile method takes the piped aeration system a step further, using a blower to supply air to the composting materials. The blower provides direct control of the process and allows larger piles. No turning or agitation of the materials occurs once the pile is formed. When the pile has been formed properly and where the air supply is sufficient and the distribution uniform, the active composting period is completed in about three to five weeks. With the aerated static pile technique, the raw material mixture is piled over a base of wood chips, chopped straw or other very porous material (Figure 3). The porous base material contains a perforated aeration pipe. The pipe is connected to a blower, which either pulls or pushes air through the pile. The initial height of the piles should be about 150-245 cm high, depending on: material porosity, weather conditions, and the reach of the equipment used to build the pile. Extra height is advantageous in the wintertime as it helps retain heat. It may be necessary to top off the pile with 15 cm of finished compost or bulking agent. The layer of finished compost protects the surface of the pile from drying, insulates it from heat loss, discourages flies, and filters ammonia and potential odours generated within the pile. There are two common forms of aerated static piles: individual piles and extended piles. Individual piles are long triangular piles with a width (about 300-490 cm, not including the cover) equal to about twice the height of the pile. The aeration pipe runs lengthways beneath the ridge of the pile. Individual piles hold a single large batch of material or a few batches of roughly the same recipe and age (e.g. within three days). Individual piles are practical where raw materials are available for composting at intervals rather than continuously. As the pile does not receive additional turnings, the selection and initial mixing of raw materials are critical to avoiding poor air distribution and uneven composting. The pile also needs a good structure in order to maintain porosity throughout the entire composting period. This generally requires a stiff bulking agent such as straw or wood chips. Wood chips are often used for composting sewage sludge by this method. Because of their large size, wood chips pass through the process only partially composted. They are usually screened from the finished compost and reused as bulking agents for another two or three cycles. As straw decomposes during the composting period, a pile with straw as an amendment can lose structure gradually. This is compensated partially by the drying that takes place as composting proceeds. Other possible bulking agents and amendments for static pile composting include: recycled compost, peat moss, corn cobs, crop residues, bark, leaves, shellfish shells, waste paper, and shredded tyres. Uncomposted material such as shredded tyres and mollusc shells must be screened from the compost and reused. To obtain good air distribution, manure or sludge must be blended thoroughly with the bulking agent before the pile is established. The required air flow rates and the choice of blowers and aeration pipe depend on how aeration is managed, i.e. how the blower is controlled. The blower can be run continuously or intermittently. In the latter case, the control mechanism can be a programmed time clock or a temperature sensor. The air flow rates are based on the dry weight of the primary raw material, such as sludge or manure. They should take into account the presence of typical amendments such as wood chips, straw, and compost. In practice, it may be necessary to adjust the timer cycle, pile size, and blower to suit the specific conditions and materials. For static pile composting, the air can be supplied in two ways: a suction system with the air drawn through the pile; or a pressure system with the blower pushing the air into the pile. Suction draws air into the pile from the outer surface and collects it in the aeration pipe. As the exhaust air is contained in the discharge pipe, it can be filtered easily if odours occur during the composting process. With positive pressure aeration, the exhaust air leaves the compost pile over the entire pile surface. Therefore, it is difficult to collect the air for odour treatment. Where better odour control is desired, a thicker outer layer of compost can be used. Pressure aeration provides better air flow than suction aeration, largely because of the lack of an odour filter. The lower pressure loss results in greater air flow at the same blower power. Therefore, pressure systems can be more effective at cooling the pile and they are preferred where temperature control is the overriding concern. In-vessel composting refers to a group of methods that confine the composting materials within a building, container or vessel (NRAES, 1992). In-vessel methods rely on a variety of forced aeration and mechanical turning techniques to accelerate the composting process. 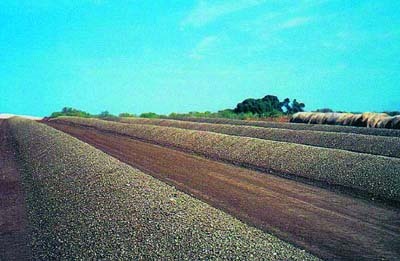 Many methods combine techniques from the wind-row and aerated pile methods in an attempt to overcome the deficiencies and exploit the attributes of each method. There are a variety of in-vessel methods with different combinations of vessels, aeration devices, and turning mechanisms. The methods discussed here have either been used or proposed for farm composting. Bin composting is perhaps the simplest in-vessel method. 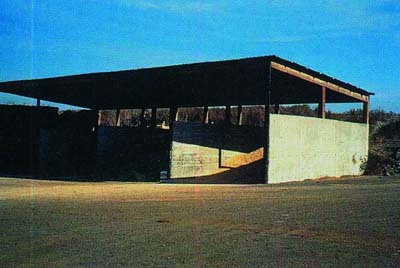 The materials are contained by walls and usually a roof. The bin may simply be wooden slatted walls (with or without a roof) (Plate 8), a grain bin, or a bulk storage building. The buildings or bins allow higher stacking of materials and better use of floor space than free-standing piles. Bins can also eliminate weather problems, contain odours, and provide better temperature control. Bin composting methods operate in a similar way to the aerated static pile method. They include some means of forced aeration in the floor of the bin and little or no turning of the materials. Occasional remixing of material in the bins can invigorate the process. Where several bins are used, the composting materials can be moved periodically from one bin to the next in succession. Most of the principles and guidelines suggested for the aerated pile also apply to bin composting. One exception relates to relatively high bins. In this case, there is a greater degree of compaction and a greater depth of materials for air to pass through. Both factors increase resistance to air flow (pressure loss). A raw material with a stronger structure and/or a higher pressure blower may be required, compared to the aerated static pile method. A lack of proper waste management services causes health and environment problems. This is a serious urban issue in developing countries. There are various projects, mostly initiated by local non-governmental organizations (NGOs), to establish community-scale waste management facilities. The Waste Recycling Development Centre is run by the Community Sanitation and Recycling Organization (Web site: http://www.bigpond.com.kh/users/csaro/), a local NGO in Phnom Penh, Cambodia, and has a small-scale, passively aerated bin composting plant. Although this may not be 'on-farm' composting in a strict sense, the techniques are valid and affordable to on-farm production and, more importantly, this is a good example of waste composting that may be applicable particularly to peri-urban agriculture. Compostable materials, such as kitchen waste, tree leaves, and coconut husks, are retrieved and sorted to achieve an effective C:N ratio and water content, and then shredded with a locally manufactured machine to accelerate composting before piling into a bin 2 m (width) × 2 m (length) × 1 m (height). Each bin is surrounded by walls on three sides. The walls are made of concrete blocks with holes. The floor is bedded with coconut shells to improve aeration in the lower part of the pile. There are also two sets of perforated plastic pipes, each consisting of one horizontal tube connected to two upright tubes. The pile collects heat quickly and the temperature rises to 70 °C. Water is added to maintain an adequate moisture content. The pile is normally turned one month later, but it is also turned at below 48 °C in order to boost aerobic decomposition. Composting is complete in about two months when the pile cools to below 27 °C. Finally, the compost is sieved, packed in 30-kg bags and sold. The agitated bed system combines controlled aeration with periodic turning. The composting takes place between walls that form long, narrow channels referred to as beds (Figure 4). A rail or channel on top of each wall supports and guides a compost-turning machine. A loader places raw materials at the front end of the bed. As the turning machine moves forward on the rails, it mixes the compost and discharges the compost behind itself. With each turning, the machine moves the compost a set distance toward the end of the bed. The turning machines work in a similar way to wind-row turners, using rotating paddles or flails to agitate the materials, break up clumps of particles, and maintain porosity. Some machines include a conveyor to move the compost. The machines work automatically without an operator and are controlled with limit switches. Most commercial systems include a set of aeration pipes or an aeration plenum recessed in the floor of the bed and covered with a screen and/or gravel. Between turnings, aeration is supplied by blowers to aerate and cool the composting materials. As the materials along the length of the bed are at different stages of composting, the bed is divided into different aeration zones along its length. Several blowers are used per bed. Each blower supplies air to one zone of a bed and is controlled individually by a temperature sensor or time clock. The capacity of the system is dependent on the number and size of the beds. The width of the beds in commercially available systems ranges from about 180 to 600 cm, and bed depths are between about 90 and 300 cm. The beds must conform to the size of the turning machine, and the walls must be especially straight. To protect equipment and control composting conditions, the beds are housed in a building or a greenhouse or, in warm climates, covered by a roof. The length of a bed and frequency of turning determine the composting period. Where the machine moves the materials 300 cm at each turning and the bed is 30 m long, the composting period is ten days with daily turning. It increases to 20 days where turning occurs every other day. Suggested composting periods for commercial agitated bed systems range from two to four weeks, though a long curing period may be necessary. Another in-vessel technique resembles a bottom-unloading silo. Each day an auger removes composted material from the bottom of the silo, and a mixture of raw materials is loaded at the top. The aeration system blows air up from the base of the silo through the composting materials. The exhaust air can be collected at the top of the silo for odour treatment. A typical composting time for this method might be 14 days, so one-fourteenth of the silo volume must be removed and replaced daily. After leaving the silo, the compost is cured, often in a second aerated silo. This system minimizes the area needed for composting because the materials are stacked vertically. However, the stacking also presents compaction, temperature control and air flow challenges. Because materials receive little mixing in the vessel, raw materials must be well mixed when loaded into the silo. This system uses a horizontal rotary drum to mix, aerate and move the material through the system. The drum is mounted on large bearings and turned through a bull gear. A drum about 3.35 m in diameter and 36.58 m long has a daily capacity of approximately 50 tonnes with a residence time of three days. In the drum, the composting process starts quickly; and the highly degradable, O-demanding materials are decomposed. Further decomposition of the material is necessary and is accomplished through a second stage of composting, usually in wind-rows or aerated static piles. In some commercial systems, the composting materials spend less than one day in the drum. In this case, the drum serves primarily as a mixing device. Air is supplied through the discharge end and is incorporated into the material as it tumbles. The air moves in the opposite direction to the material. The compost near the discharge is cooled by the fresh air. In the middle, it receives the warmed air, which encourages the process; and the newly loaded material receives the warmest air to initiate the process. The drum can be open or partitioned. An open drum moves all the material through continuously in the same sequence as it enters. The speed of rotation of the drum and the inclination of the axis of rotation determine the residence time. A partitioned drum can be used to manage the composting process more closely than the open drum. The drum is divided into two or three chambers by partitions. Each partition contains a transfer box equipped with an operable transfer door. At the end of each day's operation, the transfer door at the discharge end of the drum is opened and the compartment emptied. The other compartments are then opened and transferred in sequence, and finally a new batch is introduced into the first compartment. A sill in place at each of the transfer doors retains 15 percent of the previous charge to act as an inoculum for the succeeding batch. Upon discharge, the compost can go directly into a screen to remove oversized particles, which can be returned to the drum for further composting. On a smaller scale, composting drums can be adapted from equipment such as concrete mixers, feed mixers, and old cement kilns. Although less sophisticated than commercial models, the functions are the same: mix, aerate, and ensure that the composting process starts rapidly. A different type of in-vessel system, relies on a transportable vessel and a central composting facility. A number of local farms participate and provide manure as a raw material. Each farm receives a transportable vessel, which resembles a solid waste roll-off container. In its base, the container has aeration pipes that are connected to a blower. At the farm, the manure and dry amendments are loaded daily into the container and aerated for several days until the container is picked up and delivered to the central facility to finish composting. When the composting container is picked up, the farm is provided with another empty container to continue the cycle. The farm supplies the manure and receives bulking agent, compost and/or revenue in return.